Science and sustainability have not always run in tandem. Grand theories and schemes often conflicted with the logic of the natural world and the needs of its human populations. A review of the concept of sustainability in agriculture must first note ways in which powerful theories have shaped perception and research over the past 150 years. The 18th century Improvers (ridiculed by Jane Austen) spread to Scotland in the ‘coming of the big sheep’ described as a ‘bigger-means-better’ philosophy of agricultural improvement’ (Hunter, 1976). Large scale sheep farming removed tenants across the Highlands to be resettled or to emigrate: this period from the mid-18th until the late 19th century is known as the Highland Clearances, which shaped the attitudes and legislation defining modern-day crofting. At the same time, Scottish Improvers turned their attention to the ‘mosses‘. In the 1760s, Lord Kames of Blairdrummond began an extraordinary project to convert mosses up to 3m thick into agricultural land. By the 1840s, hundred of hectares had been repurposed by the simple method of setting several hundred families (cleared from Balquidder and Glen Lyon) to cutting up the peat with spades and flushing it into the Forth through specially built channels. (SNH 2011). Today this area is farmland; a layer of peat remains at the bottom of the Forth Estuary. Simultaneously, great gains were made in the field of industrial chemistry arising from the work of Justus von Liebig. Von Liebig’s discovery of N as an essential plant nutrient, and of the Law of the Minimum, also served to ignite a 150 year experiment in the reductionist principle. His demonstration that humus per se was not absorbed by plants, and his ignorance of the function of bacteria in the N cycle, gave rise to the widespread and profitable conclusion that natural problems could have synthetic answers. 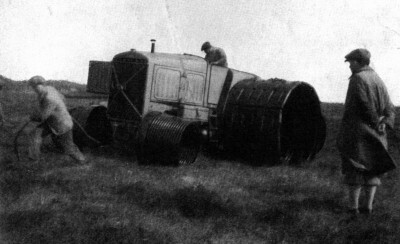 Based on the view that ‘reclamation or improvement of the great area of uncultivated land in Scotland is a problem of national importance’ (Ogg and MacLeod, 1931) the Macaulay Demonstration Farm was established in 1929; 147 acres (c.66 ha) of raw moorland near Stornoway were converted into a working farm. 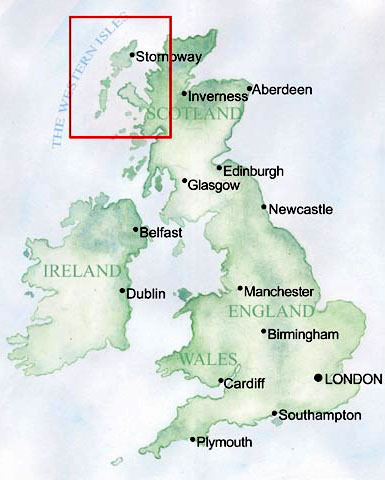 Over a 10 year period in cooperation with the North of Scotland College of Agriculture, reclamation and cultivation of the moorland was undertaken according to the science and attitude of the time. In the spirit of the Victorian Improver, the moor was forcibly re-engineered through inputs of machinery and the full array of artificials of the day. By 1939 a more modest view including the value of local resources such as fish waste (although never of local people or their experience in sustaining themselves over centuries) could be found in the farm reports. The well-intentioned, earnest wrong-headedness of the Demonstration Farm is surprising by current standards. Today, the site is invisible among moorland. World War II triggered intensive research efforts into industrial chemistry and reinforced the mechanistic approach arising from von Liebig’s insights. The paradigm of ever higher inputs of measured substances took firm hold on agricultural policy and public perception. “By 1940… the industrialisation of agriculture had already begun…World War II had proved the effectiveness of the mechanical and chemical technology that in the coming decades would radically alter both the practice of agriculture and its underlying assumptions.” (Berry, 2006). Similarly, the temper of the time marginalised the work of Fraser Darling, who understood the ecologically sound, small-scale, community-based logic of crofting. By the time the West Highland Survey was published in 1955, the government’s attention had moved elsewhere. Fraser Darling moved to America. The apparent success of the energy-intensive Green Revolution in the 1960s and ‘70s overwhelmed traditional knowledge, as the industrial model of agriculture triumphed. In the words of environmentalist Marion Edey, this was the time of ‘the Great Forgetting’ as old farmers passed away, taking their practices and secrets with them. For this reason, much of today’s work on sustainability is detection: an attempt to rediscover what had been known for many generations. Howard’s insights persisted outside the agricultural mainstream as the environmental movement developed. Aldo Leopold (1949) was influential in the development of an integrated ecological consciousness. Rachael Carson (1962) brought to popular and scientific awareness some of the defects of the petro-chemical approach: “Why should we tolerate a diet of weak poisons?…Who would want to live in a world which is just not quite fatal?” Commoner (1971) and Lappé (1971) described an impending environmental crisis. A new awareness that the natural world could be vulnerable to human intervention rejected the Victorian idea of nature as an all-powerful force to be subdued through human cunning. The concept of sustainability came to include not only the ecology of natural processes but the embodied energy of the whole system. Work on input-output ratios, from Pimentel (1996) to the IAASTD (2009), calculated that whereas low intensity agriculture might produce 10 calories for each calorie expended, high-input industrial agriculture consumed 10 calories for every one it produced. A group of practical thinkers and doers in America began to define sustainable agriculture as requiring attention to scale, to nature as the model, and to social justice. Plant geneticist Wes Jackson founded the Land Institute in 1976 to challenge the ‘technological fundamentalism’ of industrial agriculture and to research farming based on perennial crops rather then annual cereals: “The future of the agriculture long before the end of the fossil fuel interlude will depend on knowledge gained from our ecosphere’s wild ecosystems” (Jackson, 2010). “It is too simple to say that the ‘marginal’ farms of New England were abandoned because they were no longer productive or desirable as living places. They were given up for one very practical reason: they did not lend themselves readily to exploitation by fossil fuel technology… Industrial agriculture sticks itself deeper and deeper into a curious paradox: the larger its technology grows in order to ‘feed the world’, the more potentially productive ‘marginal’ land it either ruins or causes to be abandoned.” (1979). Together these American farmers and writers developed a view of farming within ecological and social contexts, and pointed out the contradictions within high-input agriculture. In 2012, a research team from the University of Iowa funded by the USDA published the Marsden Farm Report (Davis et al. 2012) on a field study from 2003 – 2011 on 9 ha of prime agricultural land. Their hypothesis was that ‘cropping system diversification would promote ecosystem services that would supplement and eventually displace synthetic external inputs used to maintain crop productivity’. The report concluded that both productivity and profitability of the three- and four-year rotations equalled or exceeded that of the standard two-year maize-soybean rotation, with much lower freshwater toxicity. The report also noted that there was greater expenditure on labour, but less on synthetic inputs. 21st century thinking about sustainable agriculture is still coloured by the reductionist theories of von Liebig and his heirs. If we continue to perceive the complex interactions of the biosphere as a series of specialised mechanistic problems, how can we even imagine the web of sustainable agriculture? Disciplines, like societies, are subject to cultural lag: the ingrained habit of reducing inquiry to small fragments still undermines the sense of context required for meaningful answers. Small scale traditional agricultural systems such as blackland crofting were caught in the middle between the high-input advice of the later 20th century, and the indigenous style of contextual management such as that advocated by Howard.